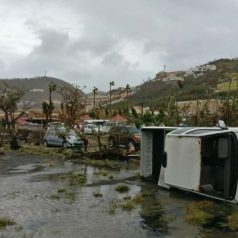 On the 6th of September powerful category five storm Hurricane Irma struck Sint Maarten with 185 MPH winds, causing widespread damage to the island and its infrastructure. 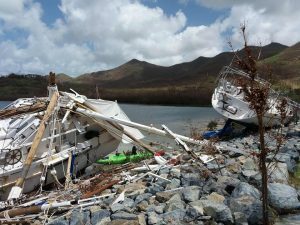 The storm also caused significant damage to the island’s nature and environment prompting the Sint Maarten Nature Foundation to conduct rapid qualitative assessments to determine the level of impact. Terrestrial and Marine Assessments were carried out from the 12th to the 16th of September and will continue after the passing of Hurricane Maria. Hurricane Irma caused significant damage to the island’s flora. The majority of large trees, some with historical and cultural significance, have been toppled. Most foliage on the island has been burnt by wind and salt spray. Most hills, valleys and other green areas have been completely defoliated leaving the island brown and leafless. Avifauna (birds) have also been hard hit by Irma’s significant winds. Although some species are showing signs of recovery, other species have been particularly hard hit. 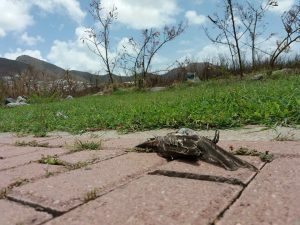 Rookery sites being monitored by the Nature Foundation of the Brown Pelican, Sint Maarten’s National Bird, have been decimated and recovery will take some time. An estimated 90% of mature mangroves have been destroyed. The area of Mullet Pond, a Ramsar Wetland of International Importance, has suffered particularly significant damage. Mangroves strands were also uprooted because sailboats tied unto mangrove roots illegally causing significant damage. Most of these vessels have now sunk. Significant debris was recorded in all wetlands and coastal areas from various sources, including an estimated 120 sunken vessels of differing size. Because of the large amount of sunken vessels large quantities of fuel have been spilled in especially the Simpson Bay Lagoon and Oyster Pond wetlands. Estimated fuel spilled in the Simpson Bay Lagoon exceeds 100,000 gallons. There has been significant run-off from land as a result of Irma’s torrential rains, drastically reducing water quality at all beaches. Several areas have raw sewage entering directly into the sea and into wetlands. There has also been a significant fish-die off in the Great Salt and Fresh Ponds due to a reduction in water quality. During assessments in Simpson Bay and in the Simpson Bay Lagoon large areas of seagrass beds have been uprooted and decimated. Although coral reef assessments have not yet been carried out, damage is expected to be extensive and significant. The Nature Foundation Coral Nursery Project structures, acoustic hydrophone transmitter arrays, conch and seagrass experiments and scuba dive moorings are non-existent due to the passage of the storm. It is also expected that solid waste disposal due to infrastructure challenges and cleanup will have significant impact on the community. The Philipsburg landfill was already over capacity before the storm and collected storm debris will contribute to the challenges regarding solid waste significantly. – Do not eat fish, alive or dead, from surrounding waters. Due to run-off seafood may be contaminated and not safe to eat. – Be careful when using beaches. The Nature Foundation has not had the opportunity yet to survey all beaches for debris and there may be sharp, dangerous objects in the water that can cause injury. – Please follow instructions from Government to not burn garbage. Burning diapers is illegal and can release toxic chemicals in the air. The Nature Foundation has escaped large-scale damage. The Nature Foundation Office, Marine Park Patrol Vessel and Warehouse received minimal damage and all personnel survived the storm without injury. Students doing their internship at the Nature Foundation were evacuated immediately after Irma and key personnel are now assisting with water and food distribution and clean-up within the community. The Nature Foundation would like to emphasize that extreme weather conditions and their frequency may be directly related to Climate Change. However, the Nature of our Island, just like her people, are resilient and will recover in due time.